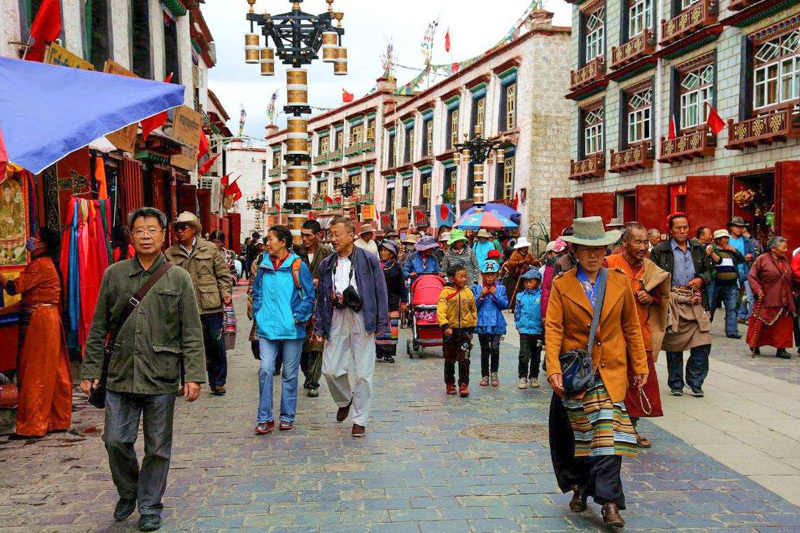 Travelers finding the crowded streets and alleyways of Barkhor Bazaar to be one of Tibet’s top cultural attractions. Travel Travel Expert (www.tibetctrip.com) discusses the wonders that are in store for travelers. Many travelers considering the crowded streets of Barkhor Bazaar to be one of Tibet’s must-see cultural attractions! Built in a traditional Tibetan style, the buildings that line the narrow streets are packed with shops catering to locals and tourists alike providing a great opportunity to see every day Tibetan life. The sights, sounds, and smell of incense wafting from giant chimneys enthrall travellers; travelers say Barkhor Bazaar is “foreign beyond imagination” and “the ultimate Tibetan cultural experience”. For travelers planning a trip, Lhasa-based travel agency Travel Travel Expert (www.tibetctrip.com) gives a preview of what is in store for you on a Tibet tour! The Barkhor area is among the most important cultural and religious assets of the Tibetan people. It is one of the Tibet travel destinations that no one should miss. At its heart sits Jokhang Temple. This temple is home to the only known image of the Shakyamuni Buddha, Siddhartha Gautama, to remain in existence today. 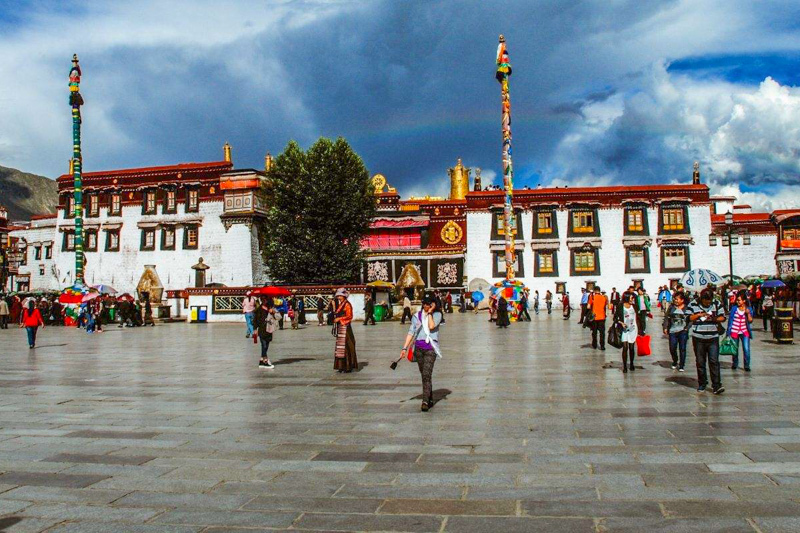 The statue and other cultural relics of Jokhang Temple draw thousands of pilgrims every year. Pilgrims walk clockwise around the temple. They spin prayer wheels and chant mantras while others prostrate in reverence. 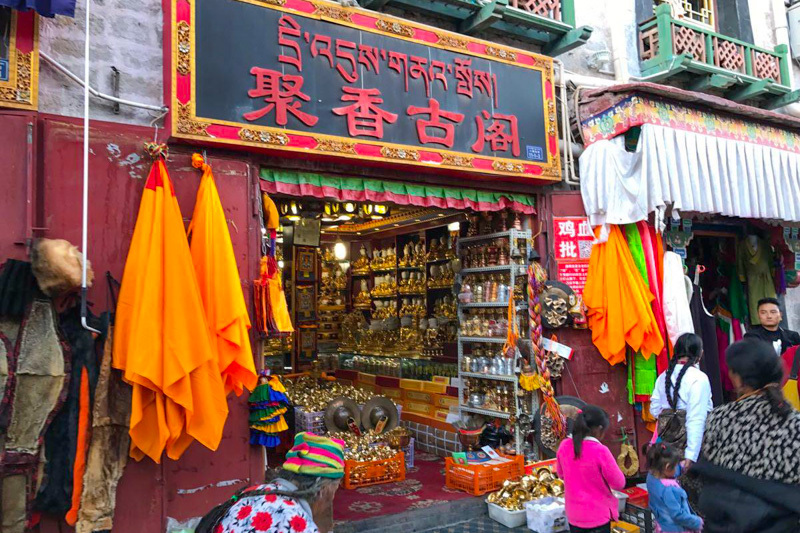 Exploring Barkhor Bazaar on a Tibet tour is a fantastic cultural experience. Travelers gain much insight into the everyday life of local Tibetans. Barkhor Bazaar is not only a great place to experience Tibetan culture, but it is also a great place to pick up authentic Tibetan arts and crafts! Alongside shops that cater to locals are shops and vendor stalls selling everything from prayer flags to hand made jewelry; travelers can even search for deals on Tibetan carpets and fine incense. Travelers are encouraged to try out some of the local food, the busiest stalls and restaurants are typically the best! Many hotels that cater to foreign travelers are located in or very near the Barkhor area and after a day of touring Tibet attractions it can be a great place to explore and unwind. Those looking to dive into Tibetan culture need look no further than Barkhor Bazaar; this is why travelers agree that it is one of Tibet’s must-see cultural attractions. When shopping, travelers will find no shortage of interesting arts and crafts to take home as souvenirs. Even with masses of visitors the every day Tibetan life that pulses through the crowded streets keeps its old-world charm strong, making the Barkhor area a unique place. With so much to see Travel Travel Expert helps travelers making time for exploring and shopping on your own during Tibet tours. Now that the travel season is in full swing. We encourage travelers to start planning and book their trip now! Email us at [email protected].